It's time for another week of throwbacks! I came across this Milani texture polish while rearranging my nail polish stash this past weekend. I'd say the texture trend has come and gone, but I know Zoya is still making PixieDusts for the upcoming holiday season? I don't think textures are really on trend now, but they're still out there. I never really got into the trend myself, outside of a handful of colors. This Milani one is really interesting. I'm not sure I love it, but I'm intrigued by it enough to give it a second go. 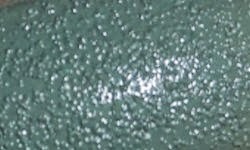 Gracious Green is a sage textured green creme. Color: I like the color of this polish. I love sage greens in fall and this color is really flattering for me. It actually makes me wish I had more sage green polishes! The texture I'm not so sure about. It has that stucco wall type texture. It's certainly unusual and I kind of like, but kind of don't at the same time? I don't make sense! Formula: I used 2 coats for this polish and it applied nicely. Price: N/A. This is no longer available. Overall: I'm so on the fence on this polish. I really don't hate it, and I kind of love it, but still not sure about it either! It's a great color I think that's why I love about it most, but that texture is just odd. It's definitely a unique polish in my collection that's for sure.